The German election campaign steps into it’s final phase. On September 22th the Germans will elect their new Parliament. During the weeks before the election maps, graphics and data visualizations are probably more widespread in the media than at any other time. Consequently there’s a peak in the demand for data driven journalism every four years. We want to contribute to the coverage and therefor release a map that focuses on one single aspect: the nonvoters of the last federal election. The basic idea behind our map is to raise awareness to the number on nonvoters by visualizing turnouts for certain areas in another way than by the ordinary choropleth map. Our focus is not on the percentage of nonvoters but on the sum and spatial distribution of individual persons that did not vote. That’s why we chose to use a dot density map, displaying one point for every ten nonvoters during the 2009 election. For our home state Hamburg we were able to get more detailed data and realized a second version with higher zoom levels, displaying one point for every single nonvoter. Of course the points do not represent real persons and their home address. Moreover, the exact location of every point was determined by a random distribution of all nonvoters in each district. For a closer & interactive look at our maps, as well as on how we realized them, take a look at our project page. 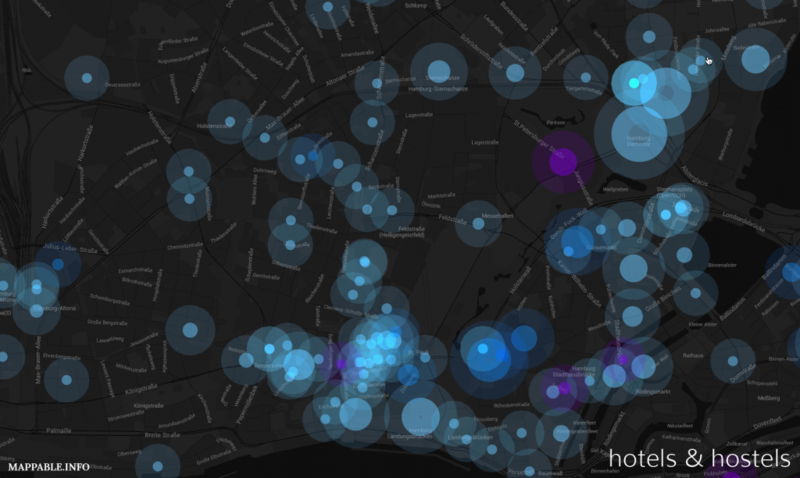 So far, our mapping tourism project visualized the spatial patterns of tourism in Hamburg by showing all hotels & hostels. But even when we only look at the places where tourists stay, this view is incomplete. Holiday rental accommodations and camp sites for example could also be considered – and of course there are online marketplaces / community platforms like airbnb. They bring together hosts and guests and thereby offer a completely new way to explore a destination. Having stayed in great airbnb apartments in Switzerland and China, meeting wonderful people, I’m personally a big fan of this concept. At the same time the hotel business is not amused about their new competitor. Whereas around 1,000 accommodations with a capacity of approx. 2,500 beds is a quite moderate number compared to more than 50,000 hotel beds in Hamburg, the situation in other cities (e.g. Barcelona with more than 11,000 airbnb listings) is different. But how about the spatial distribution of those accommodations? Are there similarities to the patterns of hotel locations or do airbnb listings show different agglomerations? But how about the direct comparison: patterns of hotels vs. pattern of airbnb accommodations? 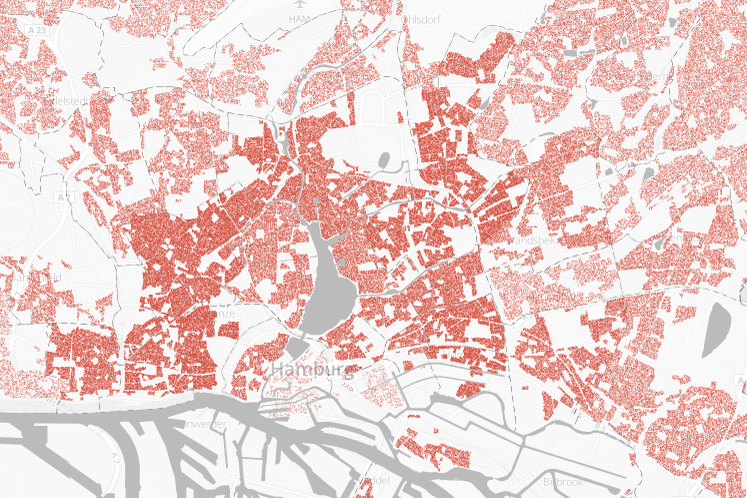 Let’s take a closer look (this time working with the same map style in both cases) at Hamburg’s most touristy areas. The Reeperbahn (bottom centre of the image) is Hamburg’s famous amusement district. It offers a wide range of bars & clubs, hosts the red light district and seems to offer a concentration of hotels as well as airbnb accommodations. Totally different is the situation at Sternschanze (top centre of the image, use the arrows to change between the two images). The close-by neighborhood is a residential area which in recent years more and more developed into a tourist destination with a huge variety of bars, restaurants and fashion stores. While there are hardly any hotels to be found, there’s a strong agglomeration of airbnb accommodations. Sternschanze is Hamburg’s ‘hipster district’. It’s only logic that we see the highest agglomeration of airbnb listings in an area that’s especially popular with young people that frequently use social networks and the like. A system like airbnb can easily adopt to changing preferences of tourists (to be more precise, it’s of course not airbnb itself that acts, but the collectivity of apartment host). Providers like airbnb thus benefit from an accommodation demand gap in quarters with limited space for new building projects whereas tourists benefit from the adaptability of these platforms. Today I want to write a few words about recent improvements of CartoDB maps. For those of you, who don’t know what CartoDB is good for: it is, at least in my eyes, the easiest and most intuitive framework for mapping and publishing spatial data online. For more detailed information take a look at their website and the awesome tutorial section. Since the release of CartoDB 2.1 around a month ago there are some neat new features like multilayer support and legends. The whole package seems to evolve from a quick visualization tool to a different kind of web GIS environment (without looking ugly or having a confusing user interface). It goes without saying, that adding legends is a key feature to any mapping framework and we’ve been waiting for this feature ever since working with cartoDB in our Mapping Tourism project. Adding legends to our maps just took me some minutes yesterday. Currently the styling options are still limited, but they’ve announced further improvements and full HTML customization for the coming months.